Whether they are the odds-on favorites or monstrous longshots, all fighters claim they never care what the Gambling Gods think about their impending matchups. 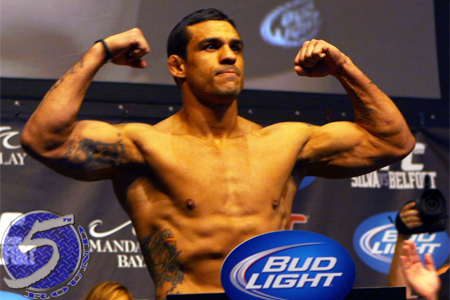 Hopefully for Vitor Belfort (Pictured), he’ll continue to keep a blind eye to the bright lights flashing in the sportsbooks because he remains a significant underdog in Saturday’s scrap against reigning UFC light heavyweight king Jon Jones. Belfort is pegged as a 5-to-1 underdog to dethrone “Bones.” Jones, on the other hand, is still a whopping 8-to-1 favorite to steamroll “The Phenom” in the show’s featured attraction. The card’s co-main event between Joseph Benavidez and Demetrious Johnson should provide a slightly more competitive battle. Benavidez checks in as a 3-to-1 favorite, while “Mighty Mouse” is pegged as more than a 2-to-1 longshot to become the Octagon’s first flyweight champion.